Submitted by Taps Coogan on the 16th of the January 2019 to The Sounding Line. The following infographic, from the cost estimation website HowMuch.net shows which countries received the most US foreign aid in 2017, the most recent year for which complete data is available. Afghanistan ($5.7 billion) remains the largest recipient of US foreign aid, followed by Iraq ($3.7 billion), Israel ($3.2 billion), Jordan ($1.5 billion), and Egypt ($1.5 billion). The following chart shows the US foreign aid given every year since the end of World War II, adjusted for inflation. From the end of World War II though 1958, including the entire Marshall Plan to rebuild Western Europe, US foreign aid amounted to roughly $548 billion in 2017 dollars. 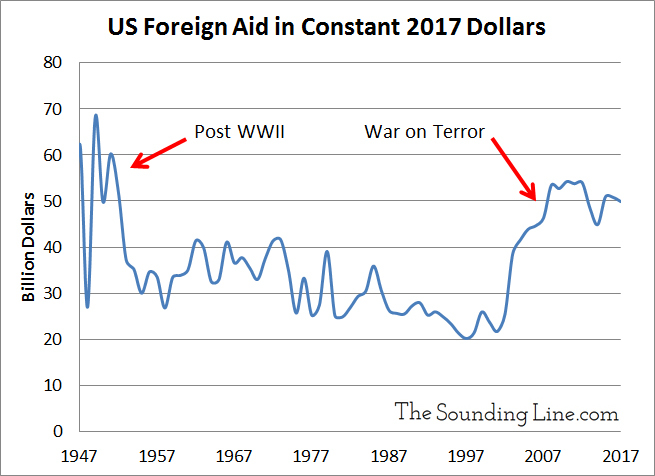 Foreign aid since the beginning of the ‘War or Terror’ in 2001 amounts to roughly $775 billion and counting, over 40% more than after WWII in equivalent dollar values. In fact, the US has provided more foreign aid to Afghanistan alone than it provided to all of Western Europe after World War II. US foreign aid to Afghanistan since 2001 ($103.3 billion as of 2017) is a staggering 45% of the entire cumulative economic output of Afghanistan since then (cumulative GDP of $226.3 billion). With roughly 3.8 million households (PDF) units making an average household income of roughly $1,980 (PDF) a year, US aid to Afghanistan since 2001 should have been enough to pay every single household in Afghanistan an average salary for nearly 14 years. When one considers that Afghanistan has received tens of billions of dollars of additional aid from Japan, Germany, Canada, Australia (PDF), the UK, and many other nations, Afghanistan has received enough foreign aid to pay every single household in the country an average salary every year since the start of the Afghan war in 2001. Meanwhile, the unemployment rate is estimated to be over 40% and rising. Now consider that Afghanistan is as poor and unstable as it has been in years and that, despite nearly two decades of promising reform, it remains among the most corrupt countries on Earth. It has been estimated that as little as 10% of aid to Afghanistan actually reaches average Afghans. The vast majority of aid money goes to NGO overhead, corruption, and waste. For what it’s worth, six of the eleven most corrupt countries in the world are major recipients of US foreign aid: Afghanistan, Iraq, South Sudan, Syria, Somalia, and Yemen. At least with the Marshall Plan there was a benefit to the US. There is no benefit from helping these countries. A pure loss of blood and treasure. Devastating. staggering indeed! How much is left to fund America complete with infrastructure repairs and new roads? Why am I hearing crickets?